English physician; born in Jamaica 1812; died June 5, 1880. He went to England in 1830 to study medicine, entered St. Thomas' Hospital, and in due course obtained his diploma as surgeon. In 1833 he went to France and graduated in medicine at the University of Paris. At this time he took part in some of the émeutes against King Louis Philippe. In 1834 Henriques went to Italy, and obtained also there degrees in medicine. He began practise in Athens, and shortly afterward went to Constantinople. Here he obtained government employment and received a commission to organize a medical staff for the Turkish army. The defeat of the Turks at the battle of Nezid in 1839 put an end to Henriques' career in Turkey. Hewas taken prisoner, but, escaping from his captors, became a wanderer without any means of support. He made his way to Egypt, where he formed the acquaintance of Marquis Litta, with whom he traveled as medical attendant through northern Europe. 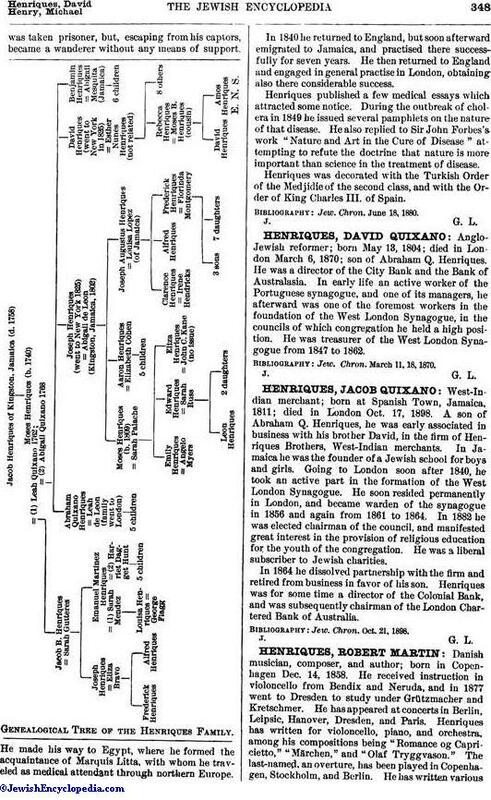 Genealogical Tree of the Henriques Family. In 1840 he returned to England, but soon afterward emigrated to Jamaica, and practised there successfully for seven years. He then returned to England and engaged in general practise in London, obtaining also there considerable success. 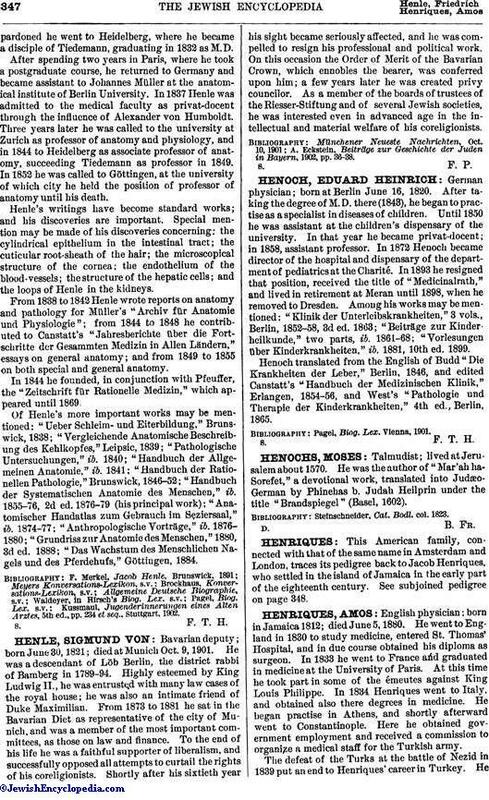 Henriques published a few medical essays which attracted some notice. During the outbreak of cholera in 1849 he issued several pamphlets on the nature of that disease. He also replied to Sir John Forbes's work "Nature and Art in the Cure of Disease" attempting to refute the doctrine that nature is more important than science in the treatment of disease. Henriques was decorated with the Turkish Order of the Medjidie of the second class, and with the Order of King Charles III. of Spain. Jew. Chron. June 18, 1880.